Washington D.C. — In 2005, San Leandro police officer Nels “Dan” Niemi was gunned down by Irving Alexander Ramirez, a 23-year-old man who’d been in and out of prisons on multiple drugs charges. Not surprisingly, the system that claimed to “rehabilitate” Ramirez for his “illegal” drug dealing habit, failed miserably. Instead of helping out a drug addicted young man, Ramirez’ multiple stays in prison had turned this man into a hardened criminal unafraid to take another man’s life. When Officer Niemi showed up to the call where Ramirez was, it was for a noise complaint. However, Ramirez was on probation for a drug offense, and he was not going back to prison; so he shot and killed Dan Niemi. Originally, Niemi’s wife, Dionne Wilson, was angry and had nothing but hate and contempt for Ramirez, who robbed her of her husband and their future together. Wilson pushed for the death penalty for Ramirez, and she was successful in her pursuit. However, now that Ramirez is waiting to be killed by a California prison, Wilson says his death would bring her no joy. Astonishingly enough, Wilson, whose husband was a cop, gunned down in the line of duty, was able to free her mind from the shackles of the prison industrial complex. Wilson opened her eyes and was able to see how this flawed system of mass incarceration creates more criminals than it stops. 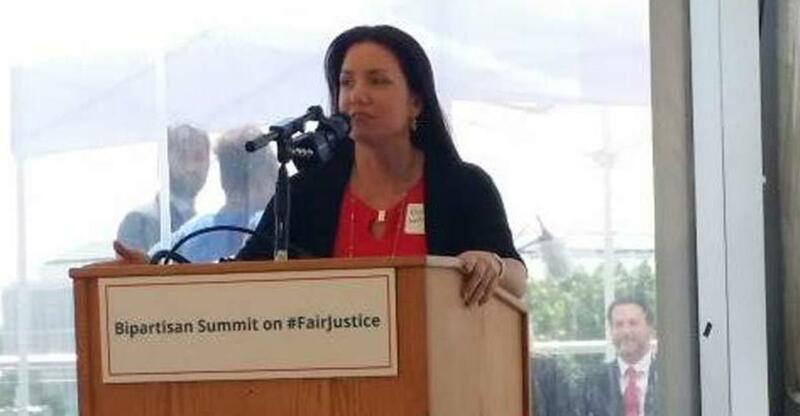 “I was really wrong about how our system works,” she told the crowd at the Fair Justice Summit in Washington D.C. on Wednesday. When her husband was first killed, Wilson wondered how it was possible that a criminal like that could be free. However, now she sees it from an entirely different perspective. Wilson now questions why he ever went into prison in the first place. “I can’t help but think how my life would be different, and my children’s lives would be different… had we passed Proposition 47 years before,” she said. Proposition 47 was one of the most damning blows to the state’s immoral war on drugs which reduced, across the board, the classification of most “nonserious and nonviolent property and drug crimes” from a felony to a misdemeanor. California became the first state in the country to stop kidnapping people for possessing arbitrary substances. There is absolutely zero justification for kidnapping someone and locking them in a cage for choosing to partake in an arbitrary substance deemed “illegal” by the state. Locking people in prison, even for non-crimes such as drug possession, guarantees a drastic increase in that person’s chances of ending up in the criminal justice system again. This vicious cycle is so well known that it has its own word, recidivism. Referring to the caging of morally innocent human beings for victimless crimes as “rehabilitation,” is a sick joke. Scarring someone’s future potential by removing their ability get a decent job, creating an incentive to delve back into the criminal market, is not rehabilitation, it’s nefarious. Despite Wilson’s tragic past, she remarkably managed to see it that way. “I don’t think that anyone can tell me that had we invested in people over prisons, my husband wouldn’t be here today,” Wilson said as she drew obvious attention to the corporatist prison model in the United States. Wilson’s words are based in sound science. Study after study shows the harmful effects of a society with such a high rate of incarceration. High recidivism rates are not unique to Texas: Within five years of release more than 75 per cent of prisoners are arrested again.